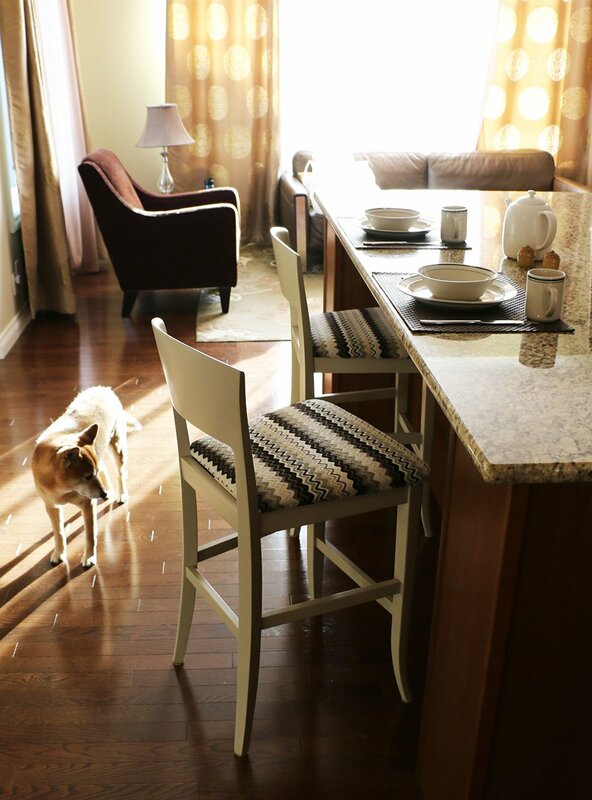 An extremely awesome friend of mine, Jessica, had these counter height stools in her home. She was done with them. They just weren’t working for her any more and when I took them off her hands I could almost feel the relief washing over her. You’ve all had that feeling haven’t you? That purging sense of freedom that comes when we part from an unwanted item? 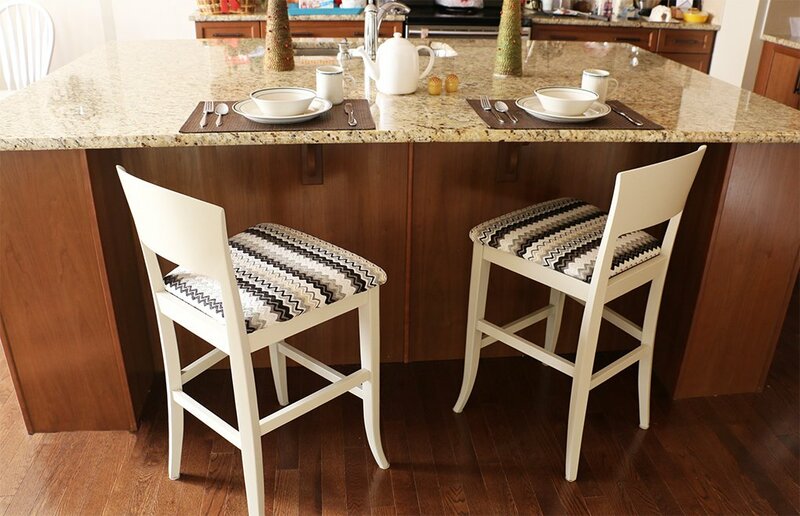 I was happy to snag them because even though they were a bit dated and even though the seats had a few stains I knew they were ideal for my island breakfast bar. I liked the shape of them and they were just the right height. I’d been looking for something with simple lines and I’d found it in her unwanted stools. We are getting down to the holidays and I wanted to spruce them up beforehand so we had some extra seating, which is always helpful, and I was pretty surprised by how quickly this project came together. The most time consuming thing was picking out a new fabric to cover the seats with! In the end I went with this budget conscious zigzag and I’m glad I did because I think it fits the room really well. A project like this is an easy way to brighten up your home before hoards of holiday guests arrive. 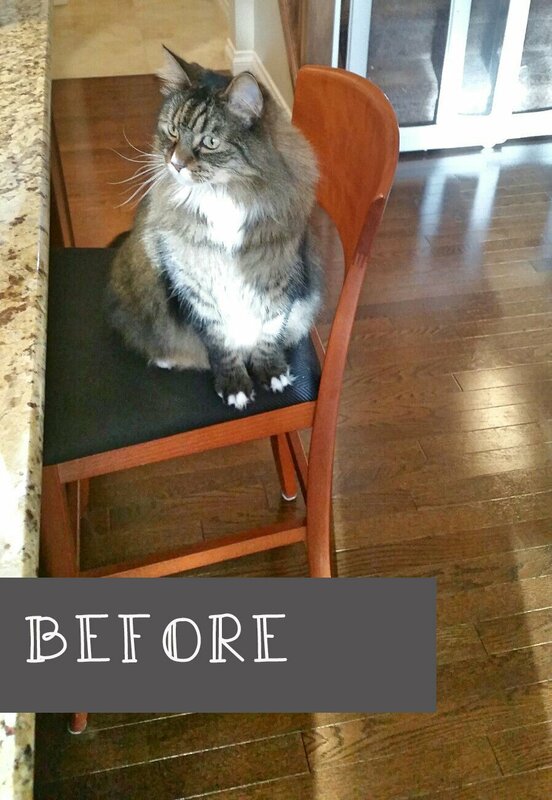 It’s pretty easy to find inexpensive second hand chairs and it doesn’t cost much to give them a makeover. My chairs were free, small sample size pots of CIL Paint are really inexpensive, my fabric cost $30 and I spent about $15 on a new brush and roller. It was little cash spent for a big impact to our entertaining space. Assess the wood. If it has flaking varnish or other surface damage give it a light sanding and you may wish to prime depending on the paint you’ve chosen. I used Melamine Paint and my chairs were in good nick so I skipped sanding AND priming *gasp*. 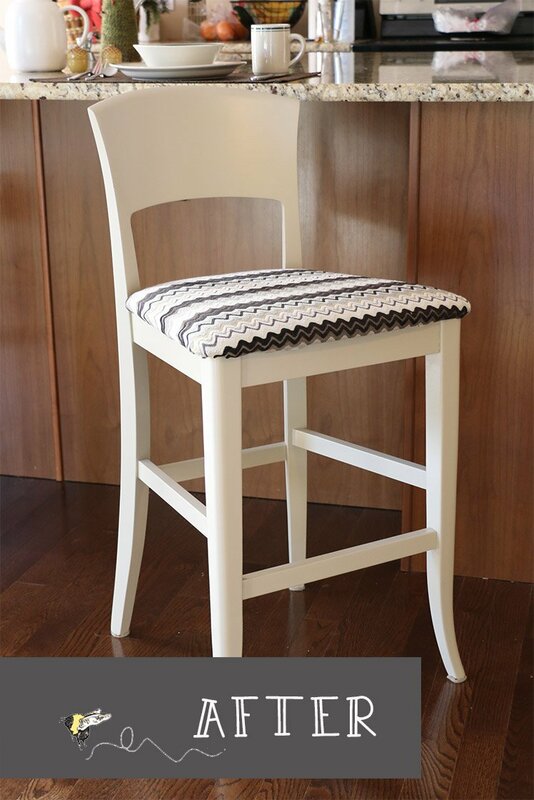 Paint the wood on your stools – use at least 2 coats according to specifications on the paint pot. For more tips on using Melamine Paint like I used, read about my Oak Table Makeover. Use the angle brush to get into the corners and roll the seat backs and straight bits with the foam roller to reduce brush marks. Take care not to use too much product. I used 1/2 a metre of fabric for my seats and even had a bit left over. Position the seat on the fabric and cut around it leaving enough allowance to pull around to the underside and wrap the seat. Staple to secure beginning at center back, then center front, center on the sides etc. Then work, pulling fabric taught as you staple around the seat. Trim corners to fit as needed. Once paint is dry, re-attach the seats. Let paint cure as long as possible, taking care not to knock or nick very fresh paint. You’d think my house was overrun with animals. The dog had to get in on the action too. What a bunch of hams! I’m just so pleased with how these stools turned out. It took me about 10 min per coat of paint, per chair. I did two coats. It also took me about 10 min to recover each seat. I wish every project was this quick and easy (and cheap!) Check online classifieds to find inexpensive seating to revamp. Or, if you’re really lucky like me, maybe you have an awesome friend who will breathe a sigh of relief when you take her old chairs out of her basement. ** This post is sponsored by CIL Paints. All opinions, images and design choices remain my own. Oh my goodness, they look so much better! Those are adorable! 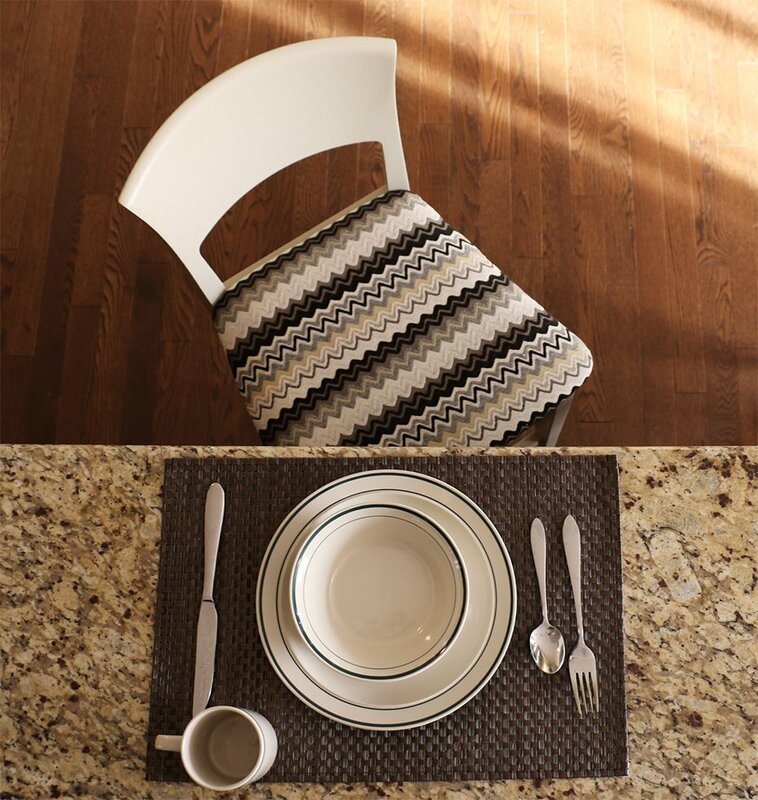 I love the fabric you chose and the transformation is amazing! They were fine before, and stunning now! THAT LOOKS AMAZING. I totally feel like I could do this. What did you do with your kids..? Wow… what an awesome transformation! They look great!